Enjoy two nights of luxury in the Rebel County. WITH BEAUTIFUL BEDROOMS, a bistro style restaurant, luxury spa and an extensive health club, The Kingsley has everything you’ll need for the perfect break away from the little ones. Set in a stylish, distinctive location on the banks of Cork’s River Lee, The Kinglsey is within walking distance of Cork’s cosmopolitan city centre. Shopping, socialising and cultural attractions are all just a short stroll away, along with those beautiful riverside views. 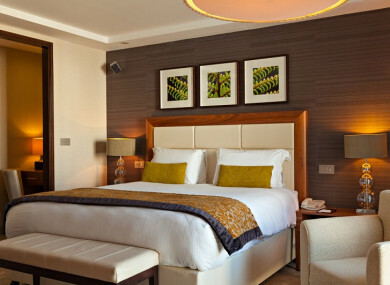 This week, we’re giving one lucky reader of TheJournal.ie’s Family Magazine a two-night stay in one of The Kingsley’s luxurious rooms with breakfast on both mornings. How to enter? Simply email your name and location to competitions@thejournal.ie with ‘Family Magazine – The Kingsley’ in the subject line. If you haven’t already, you’ll also need to like TheJournal.ie‘s Family Magazine on Facebook and Twitter. It’s that easy. Plus, don’t forget to subscribe to the magazine using the box below, to stay up-to-date on the latest family features and offers. If you aren’t lucky enough to win on this occasion, visit www.thekingsley.ie or call 021 480 0500 for more about The Kingsley’s current offers. Terms and conditions: Prize is 2BB for 2 x people, subject to availability, non-transferable and not valid for Christmas, New Year’s Eve or bank holiday weekends. Full Journal Media T&Cs are available here. Email “Win a springtime escape with two nights of R&R at The Kingsley in Cork”. Feedback on “Win a springtime escape with two nights of R&R at The Kingsley in Cork”.